The earliest records of Wannops in Cumberland come from the Crosby area in the later 1500ʼs, from a heartland centred on Warwick Bridge, reaching into Crosby, Irthington, Hayton and Wetheral parishes. The direct line of the branch of the family down through Arthur Robson Wannop is unclear before the mid 1600ʼs. A clue lies in papers from 1912 related to Longthwaite Farm at Warwick Bridge, which was inherited through the family and owned but leased out in 1912 and up to their deaths by Arthur and Thomas Wannop of Blencow, sons of Arthur Wannop and Ann Thornburn. 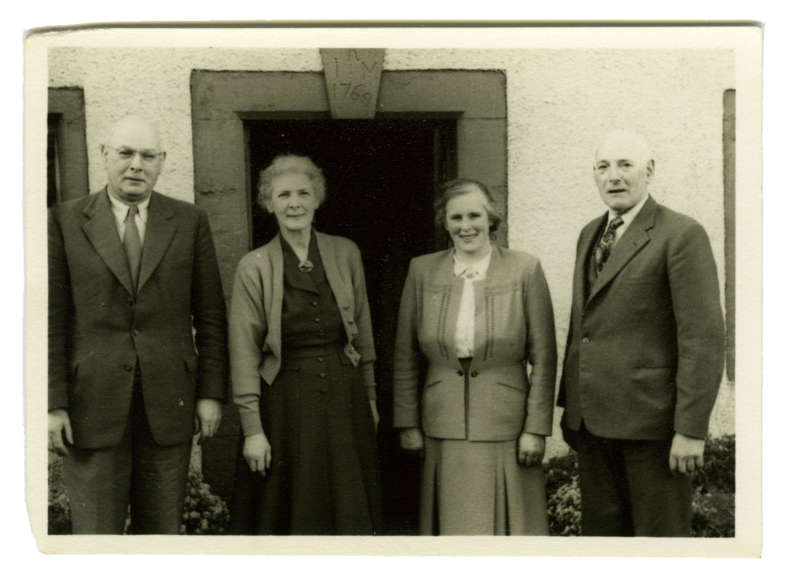 Thomasʼs share in the farm was passed on by Thomas Wannop to his wife Esther Ann and thereafter to his son Arthur Robson Wannop and daughter Mary Railton Wannop, who jointly disposed of Longthwaite sometime after 1946. Although probably originally occupied by the family line, Longthwaite must have been tenanted for many years as the line appears to have moved to farm in the area of Lowhouse and Laversdale by the later 1600ʼs. It is possible but not certain that Longthwaite was the same tenement for which Carlisle Records Ofﬁce registers a (missing) inventory dated 1604 for a recently deceased Christopher Wannop of Langthwaite. Having ﬁrst moved to farm in the Lavers-dale Quarter of Irthington, the direct family line had spread into the Walton area by the very early 1700ʼs, settling there and in Lanercost parish for approaching 200 years before moving on to Blencow near Penrith. A Christopher Waynopp is recorded in the Naworth household books as having a tenement at Brampton in 1649, but it is unknown whether this may have had any connection with cottages at Milton, near Brampton, which like Longthwaite Farm were inherited through the Arthur Robson Wannop family line and maintained after its move to Little Blencow after 1860. Records for the Walton area are less complete or less legible than for the parishes around Warwick Bridge. It seems likelythat in the very early 1700ʼs the Wannops had only recently begun to move into Walton from Irthington. In 1685 an Arthur Hetherington is recorded as having a son born to him at Hillﬁeld, but in 1703 the marriage of an Anne Wannop to a William(?) Addison of the adjoining farm of Walton Rigg suggests that Hillﬁeld may have already become occupied by Wannops. The Charles Wannop who became a churchwarden at Walton in 1708 was presumably already established in the parish, and may have been the same Charles Wannop of Hillﬁeld who married Mary Routledge at Walton in 1720, she being from Dovecote, nearby. 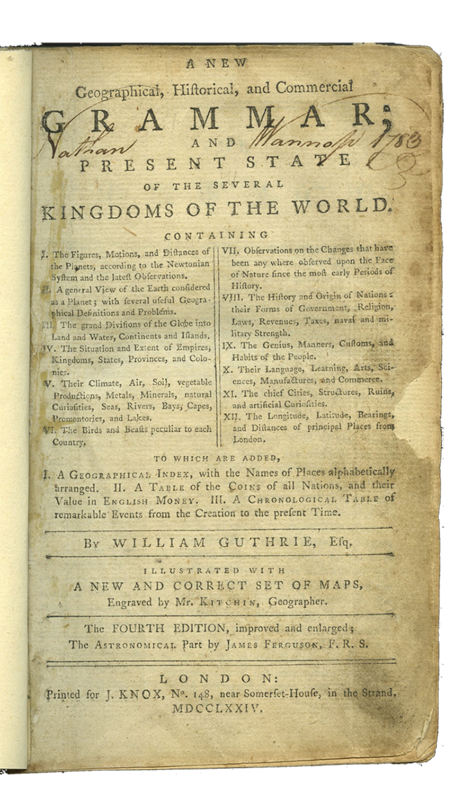 However, the Christopher Wannop buried in 1768 at St. Kentigernʼs in Irthington had died at Hillﬁeld aged 56. Because Christopher was not buried in Walton, it conﬁrms the implication of his will naming the farms in Irthington occupied by his brothers that he like they was born and brought up in the parish of Irthington; their parents were seemingly the John and Mabel who occupied the farm of Lowhouse. Christopherʼs brother Nathan, survived him at Hillﬁeld but was a churchwarden at Walton and is buried in the churchyard there. Having entered Hillﬁeld, the line settled there for almost two hundred years, branches spreading to occupy several other local farms in Walton and Lanercost at different times over that period. The practice of primogeniture meant that the eldest of any sons inherited family farms. Only after 1860 did the line branch out to Blencow near Penrith, but Hillﬁeld re-mained in its hands until Wannops pro-gressively moved away from the Irthing Valley from the mid 1800ʼs, leaving to other parts of England or to North America. Nathan John Wannop took over Hillﬁeld at his fatherʼs death in 1860 but had retired by 1881; of his two sons, James the elder farmed at Scaleby before emigrating to Canada, and William the younger left the land to be a stationer. At that time the changing economy was taking people to new occupations in the towns, or younger sons like those of our line who wished to remain in farming had to move on. New farming countries were developing. Adam Wannopʼs move to Little Blencow around 1862 followed the return to Hillﬁeld of his elder brother upon the death of their father, Arthur, with whom Adam had worked Hillﬁeld. 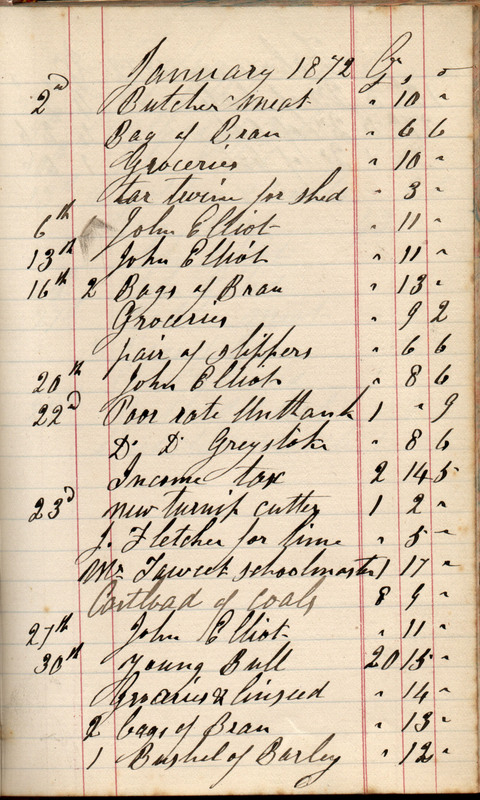 Adam Wannopʼs account book for Little Blencow Farm for 1870-79 shows annual farm income and expenditure, and also domestic expenditure including school fees, groceries, shoes, local highway and poor rates, coal, a fat goose for Christmas, a dog cart licence and a new piano, as well as farm income and expenditure including nails, horses, heifers, sheep, guano and Indian meal. Income tax in 1872/73 amounted to £1 19s. 3d., signiﬁcantly less than paid in local poor and highway rates. A principal domestic cost was for butcher meat. There are payments for the services of Mr Robinson the miller at Greystoke and Mr Moffat of Laithes Mill, Mr. Pears the veterinary surgeon and Mr Graham the blacksmith. Entries record stock sold at market at Hawick. The 1871 Census recorded Adam and Barbara Wannop and their children in residence at Little Blencow together with Mary Jane Little as a 21 year old general servant, and Joseph Bainbridge as a 17 year old domestic servant. 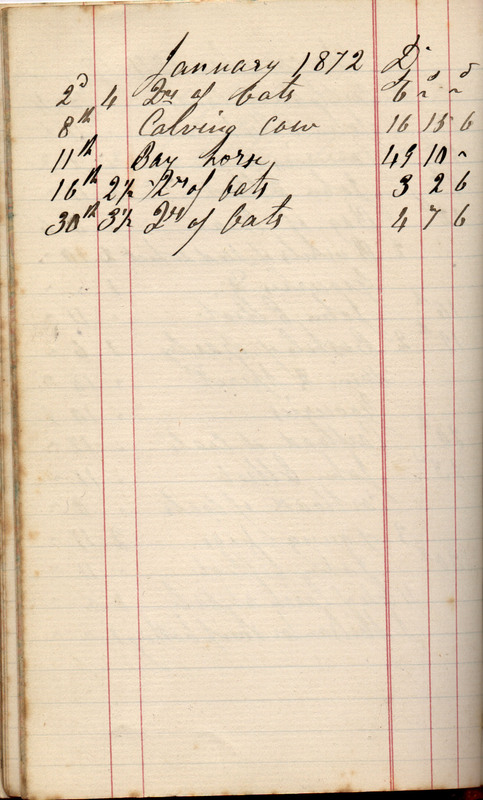 The two live-in servantsʼ combined wages are recorded in the farm accounts as £13 at May 1871 and £16 15s at November 1871; these appear to have been the wages for six months, apparently paid twice yearly. John Elliott the farm servant was comparably paid 10s. a week in 1871 rising to 13s 6d a week by 1871. Excluding from the accounts what seems to be domestic rather than farming expenditure, it appears that in 1872/73 there was a net return of about £1 16s. an acre for the 130 acres of Little Blencow. It is interesting to compare this with accounts for an Essex demonstration farm of 175 acres, which has been assessed as making a net income of between £2 10s. and £3 an acre over the period 1865-69. Little Blencow was originally tenanted from Ennim Estates but wholly acquired after Thomas Wannop died in 1930, leaving his one-fourth share in the business of Little Blencow Farm -carried out in partnership with his son Adam – to his trustees Esther Ann, Adam and Arthur Wannop. After the death of Esther Ann, her share was to be divided equally between her children Adam, Isabel and Mary Railton Wannop. Thomasʼs interest in Longthwaite Farm at Warwick Bridge was left to Arthur Robson Wannop and Mary Railton Wannop in equal shares. His interest in cottages at Milton, near Brampton, was left to his widow Esther Ann Wannop, and after her death to Mary Railton Wannop. 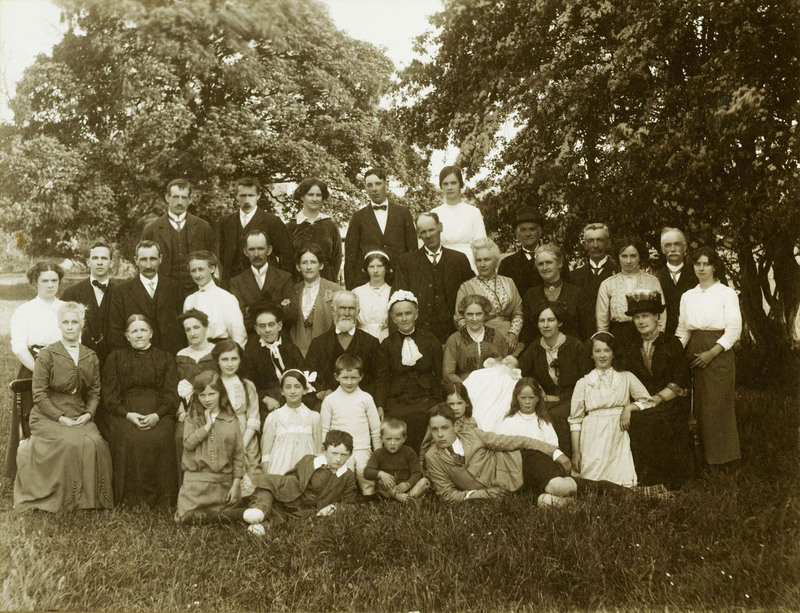 Recorded at Little Blencow Farm at the 1901 Census were the Wannop family of Thomas (36), Esther Ann (33), Adam (4), Isabella (3) and Arthur (8 months), to-gether with Frances A. Thornthwaite (19) a domestic servant and four farm servants, John Buckle (29), Richard Noble (18),Thomas Ridley (15) and Frederick Newton (14). Blencow Grammar School, which Adam (Addie), Isabel (Billie) and Arthur Robson Wannopall attended was founded by Thomas Burbank, who in 1577 endowed it with land at Culgaith near Penrith and at Brixworth in Northamptonshire. Much of the endowment was subsequently squandered by bad investment, but the school was rebuilt in 1793 with the founderʼs name over the door. 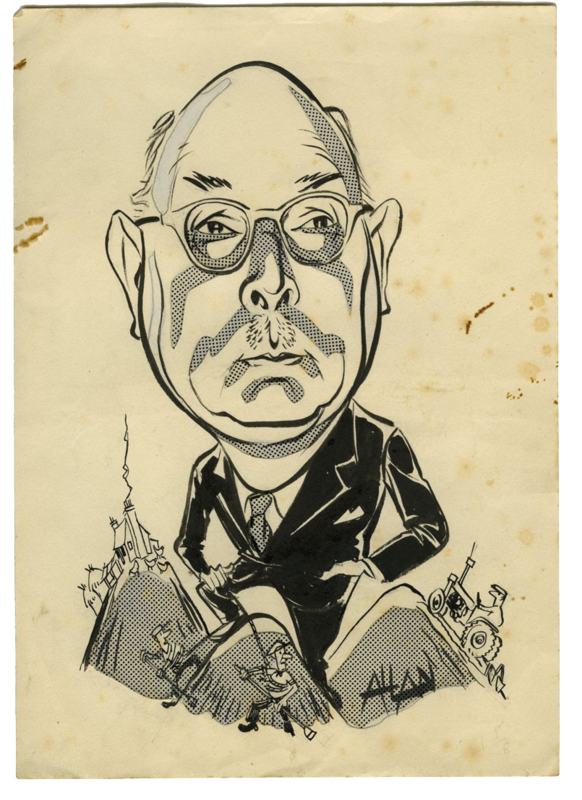 As well as Wannops, former pupils included a former Lord Chief Justice, Lord Ellenborough, and George Whitehead the notable Quaker. 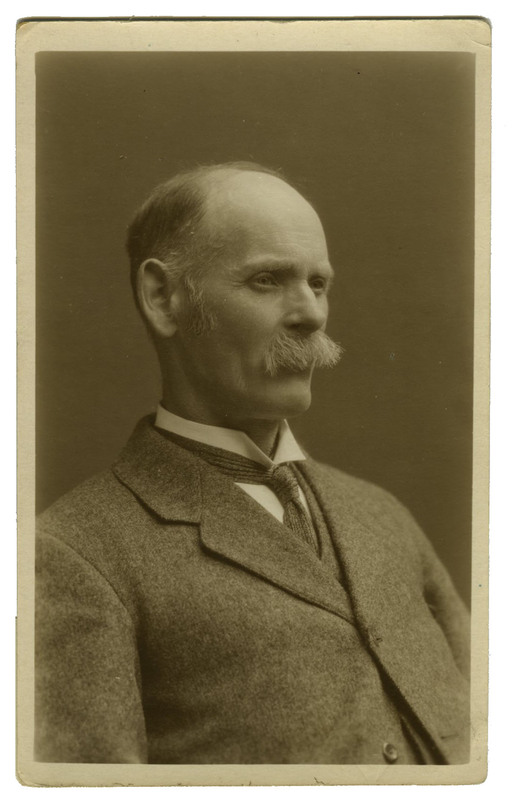 Arthur Robson Wannop was one of the last pupils, leaving for Penrith Grammar School when the small Blencow school closed in 1911.